The pentagram undoubtedly took upon itself the aura of protection by being 'capable' of holding a thing within it. This due to its quality of the 'impervious lines' being drawn such that the more vulnerable vertices lie outwith the central containment. As well as no weak corners, the single continuity of the line makes the shield 'stronger' than (say) the hexagram where a single component triangle edge can be 'attacked and depleted' and overcome while not having to sap the 'other half of the power' imbued within the companion triangle. It is the simplest 2d figure of this kind (and, to boot, works quite well with a Vitruvian Man symbology, for aesthetic purposes) so although seven+ vertex regular N-grams (anything capable of coprime vertex skipping) also are cross-continuous in this way, this is the root form. So that led me to wonder what the equivalent would be in 3d (and maybe more). For obvious reasons, a stellation of anything other than a cube could not be drawn with a single continuous edge, and a stellation of a cube is just an octahedron, and unsuitable for our purposes just as a "tetragram" (in the 2d geometric sense, rather than the writing one) is not possible. So do we look towards continuity of surface, instead? 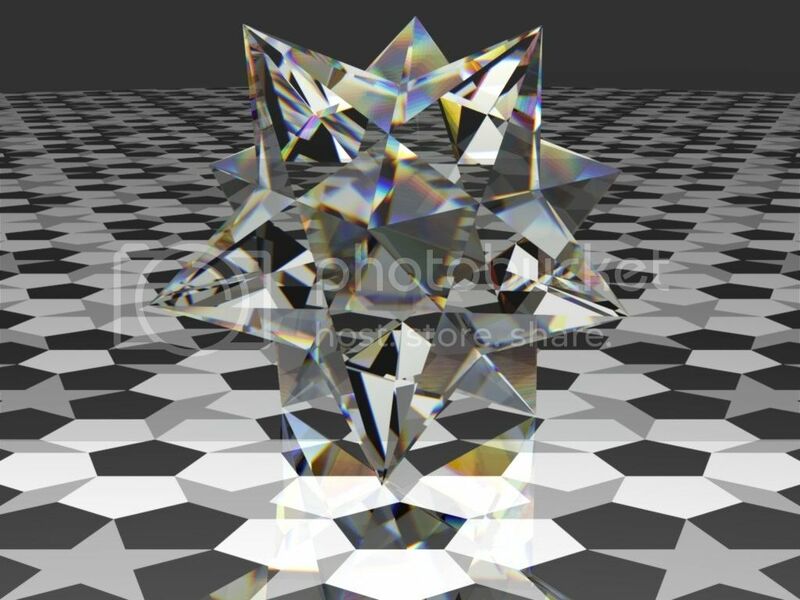 That would rule out the stellated octahedron (composed of overlaying two tetrahedra, equivalent to the two triangles in the hexagram, sharing nothing but space and corner-edges only created by their sharing). From mental visualisation, I've reduced it to two different likely base forms. The figure formed of 'pentagram faces' that is the Small Stellated Dodecahedron works to contain a dodecahedral centre with all vertices protected, but we might be worried about the edges being vulnerable as they are internally exposed. Its dual, however, is the Great Dodecahedron where the vertices and edges (in the form of an external icosahedral framework) lie entirely outside the surface-only inner confine. But, for either case, am I missing a simpler construct? And how might the generalisation progress in further dimensionality? I can see us [ienclosing in 4d with SSDodecahedron 'faces', as far as I can work out (but can't quite work out if this still just protects vertices, not edges and now not the planar faces) but I'm not sure about the next level up for the GDodecahedron simile (vertices, edges and 'faces' lie out beyond the internal intersections of the volumes that act as the wholy enclosing barrier to a 4d inner zone). And though I'm half-happy that the value of the five-based periodicity is vital (being coprime with three, the lowest alternative counterpart value in the construction, and no apparent need to invoke further primes¹) I may have missed a simpler form that does what I need. This isn't exactly an urgent problem to solve. It's not like I have an imminent need to confine a hyper-monstrosity from some higher dimension of Hell, or anything *get back, you fiend, get back, I tell you, and let me build my tesseract-brick wall in piece!!! *, but it has occupied my mind for most of the morning (and a little bit of the post-prandial timeslot) too, and I'm probably at the limit of my capabilities this side of a particularly intense fever-dream. And I thought that, amongst the various outlets of which I might habitually bother people with this kind of thing, you're the likeliest bunch to appreciate the idea, even if you don't then take it further. ¹ Caveat: I've been assuming that a pentagram is Five Points each skipping to the third point, complimentary to the expected skip-to-2nd. If the pentagram is 2nd vertex to form triangles then maybe SSDodecs is 2nd (least distant) vertices to form TRIangles across a FIVE-based solid. Then the next level up may properly invoke a SEVEN-based volume, and yet I can't quite count that factor in my head so right now I'm sticking with the three-over-five as universal at each raised power of dimensionality. wikipedia wrote: There are no stellations of the cube, because non-adjacent faces are parallel and thus cannot be extended to meet in new edges. If you use the different process of adding pyramids to all the faces, then you can turn the cube into the Rhombic Dodecahedron, but it still won't get you the octahedron. Did someone say rhombic dodecahedron? I'm rather fond of those, as you might be able to tell from my avatar. 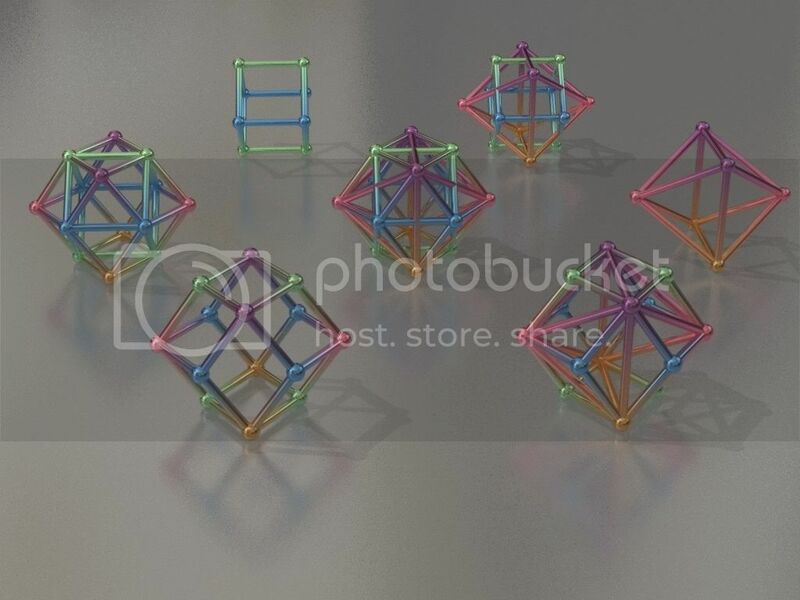 The spoilered image shows the relationship between the cube, octahedron and rhombic dodecahedron (ray-traced using POV-ray). As for pentagons and pentagrams, one reason that they've achieved a lot of attention is that they are constructible (with the traditional (unmarked) straightedge and collapsible compass), although the construction isn't immediately obvious unless you do some algebra. However, the heptagon / heptagrams, and other odd low numbered n-gons and n-grams are not constructible. The Alexandrian Greeks knew that the 15-gon is constructable, and Gauss proved that the 17-gon is constructable (a month before his 19th birthday! ), but it wasn't until about 1800 that the first explicit construction of a heptadecagon was given by Erchinger, according to Mathworld. Gauss proved that a regular n-gon can be constructed with compass and straightedge if n is the product of a power of 2 and any number of distinct Fermat primes (including none). Pierre Wantzel later proved that this is a necessary condition. There are only 5 known Fermat primes, and it's widely believed that no more exist, but Fermat numbers grow so rapidly that it soon gets very hard to test them for primality. So as far as we know, there are only 31 constructible polygons with an odd number of sides. As for higher-dimensional stars, here's a small stellated dodecahedron on a Penrose tiling floor (also done in POV-ray). I don't quite get what Soupspoon means by "protected vertices", but maybe I will after further thought and some sleep. Yes (@jaap), stellation was the wrong term (it even red-underlines as not in the dictionary, but that's a different error, and wrongly so), for the cube it'd be extruding polyhedrally-based conic sections from the faces. Not (in this case) extending plane faces out to create slopes planar to other plane-faces (that also happens in proper stellation). The difference between 'aiming' across an existing plane and creating a completely new one. And you're right about the difference between the dual and the rhombic dodecahedron. Well spotted, as I'd totallg forgotten the effective 'twist' difference between the two add-ons as I juggled wireframe images in my head without verifying. My thanks for spotting that slip. PM 2Ring wrote: I don't quite get what Soupspoon means by "protected vertices", but maybe I will after further thought and some sleep. A being capable of being held by a line of force defined by (say) lit candles might well be temporarily stumped by being held within an N-gon even as simple as a triangle, but the corner-candles straddle the 'line of protection', and are therefore vulnerable to being extinguished (thus destroying the power of the line, if that's what they're there for) without some additional mystical around-the-point protections that would take more (and different, and separately 'fuelled'/sustained?) arcane effects to counter. A penta(/greater)gram setup hides the vulnerable points beyond the force-wall (assuming that 'crossing the streams' is trivial and not disadvantageous to the whole effect). So setting up the single unbroken chalkline between the five or more¹ more or less perfectly placed points² ensures the defining vertices are as protected as the world outside as a whole. In extending beyond 2d I considered both just 'protected vertices' (a 'statellite' configuration around protected zone has the static-satellites produce some sort of lines and planes of force that created the inner container but themselves stay outside) and also 'protected edges' (the central polyhedron is formed of plane-segments that don't touch the respective 'maintained' plane edges, only the plane is in contact with the dangerous volume of space, the point-definitions and the (possibly physical) side-edgings between the appropriate vertex units (that also define the fullest plane area) are beyond touch), and you can similarly optionally scale the number of dimensional protections (points, lines, volumes, …) that are necessary upwards through any further dimensions of enquiry, so long as you realise that the last one in the sequence is going to be the one that needs to 'do the work' of being the barrier. Which you probably realised long before I got around to concluding that explanation! ¹ Not getting Weak Certificate for that Wiki! ² I'm not sure about how perfectly straight-edge-and-compassed the pentagram needs to be, it's often depicted as a hastily freehand-chalked figure as needs require, the usual failing being a non-diabolical foot scuffing the line before/during use to allow the summoned/imprisoned being within to give the creator of the device the shock of his life. And possibly the last one.